An aerial view of the National Stadium at Briggs Park. The bleachers have been completed, the 10 floodlight poles have been erected, the cycling and running tracks are ready for use and work on the grandstand is moving rapidly. In the foreground are the swimming and diving pools (right) and the arena for games such as basketball and netball (left). The National Stadium is the home of Jamaican sporting greatness, both in football and athletics. In the case of the former, it was nicknamed ‘The Office’ during the Reggae Boyz historic Road to France campaign for the 1998 World Cup. 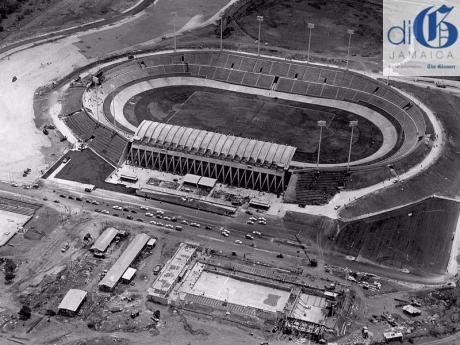 The groundbreaking ceremony for the construction of the facility, which seats 35,000, was held on January 6, 1961, and the world-renown American athlete Jessie Owens was the guest speaker. But how did the stadium come to be? We have the great Sir Herbert Macdonald to thank for its existence. The 1962 Central American and Caribbean (CAC) Games were awarded to Jamaica in 1959, and Macdonald was one of the first persons to recognise that the facilities that existed at the time were inadequate. 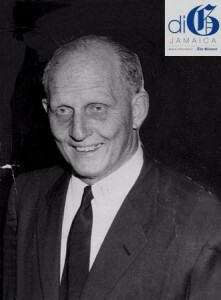 Reports are that Macdonald approached then Premier of Jamaica, Norman Manley, and the Leader of the Opposition, Sir Alexander Bustamante, and sold them the idea that it was necessary to build a stadium to accommodate the Games. They agreed, and the hunt was on for the perfect spot. Several sites were looked at, including Tinson Pen and the site on which the former Gun Court, now the South Camp Adult Correctional Centre, is situated, but these were not large enough. He then thought about Briggs Park, adjoining Up Park Camp. A meeting was held with then Governor of Jamaica Sir Kenneth Blackburn, Manley, the brigadier commanding the British Army stationed in Jamaica, the Army’s land officer, Permanent Secretary VC Smith, and they agreed on 80 acres at £3,750 per acre, for a total cost of £300,000. The Jamaica Government paid down £100,000 to seal the deal and the British government eventually decided to treat the balance as an Independence gift to Jamaica. The McDonald Tunnel, one of the entrances to the grandstand and the infield, is named after the man who spearheaded the mission. Unfortunately, his surname is misspelt.